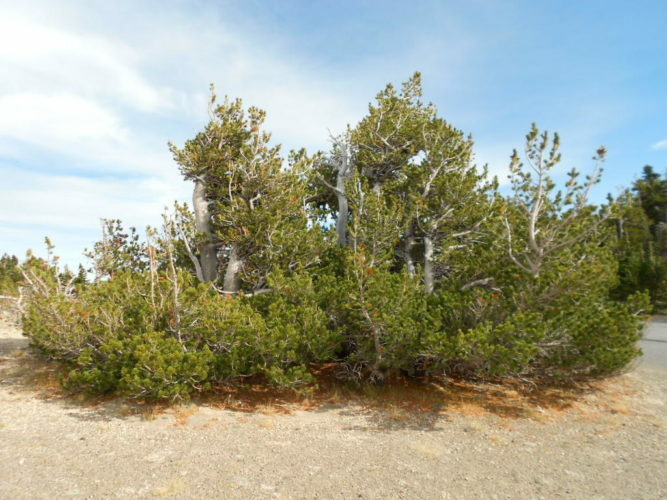 Pinus albicaulis, as described in 1863 by Georg Engelmann (1809–1884), is commonly known as whitebark pine, as well as pine à blanche écorce in the French language. The scientific name literally translates into "white-stemmed pine" in the Latin language. Description. 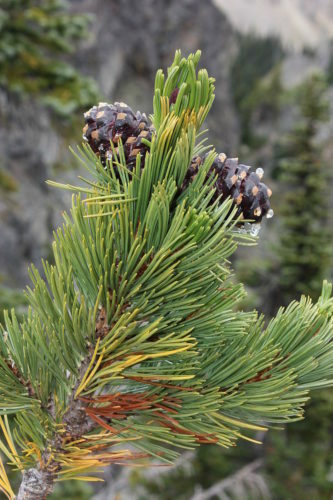 Whitebark pine is an evergreen coniferous species of tree that grows to mature heights of 65 feet (21 m tall) with a trunk up to 4.5 feet (1.5 m) in diameter, measured at breast height; it can be straight to twisted and contorted. Its crown in conic in shape, becoming rounded to irregularly spreading with age. Bark is pale gray, appearing whitish to light gray from a distance. It has smooth texture, separating into thin plates with age. Twigs are stout, pale red-brown, with light brown, often glandular pubescence, somewhat roughened by elevated scars, aging gray to pale gray-brown. Buds are ovoid shaped, light red-brown colored, 0.32 to 0.4 inch (0.8 - 1 cm) long with entire scale margins. Leaves (needles) grow in bundles of 5 per fascicle, mostly ascending and upcurved, persisting on the tree for 5 to 8 years. They are 1.2 to 2.8 inches (3 - 7 cm) long and 0.04 to 0.06 inch (1 - 1.5) mm thick, mostly convergent to a single point. They are deep yellow-green colored, abaxial surface less so, adaxial surface due to being conspicuously whitened by stomata, margins are rounded. Pollen cones are cylindro-ovoid shaped, circa 0.4 to 0.6 inch (10 - 15 mm) long and scarlet colored. Seed cones remain on the tree indefinitely unless dislodged by animals. They do not open naturally but only through animal interference. They are spreading, symmetrical, broadly ovoid to depressed-ovoid shaped or nearly globose, 1.2 to 3.2 inches (4 - 8 cm) in size, dull gray- to black-purple colored, sessile to short-stalked. Scales are thin-based and easily broken off. Brown colored apophyses are much thickened, strongly cross-keeled, with an upcurved tip. Seeds are obovoid shaped with a 0.28 to 0.33 inch (7 - 11 mm) body, chestnut brown colored, wingless, and edible. Distribution. This species is native to USA and Canada, at montane to timberline elevations of 4,300 to 12,200 feet (1,300 - 3,700 m) above sea level in the Rocky Mountains of Alberta, British Columbia, Montana, Idaho and Wyoming. Also seen in the Coast Mountains of British Columbia, as well as the Cascade Mountains of Washington and Oregon; and in certain isolated inter-mountain ranges of eastern California and Nevada. Hardy to USDA Zone 2 — cold hardiness limit between -50° and -40°F (-45.6° and -40.0°C). 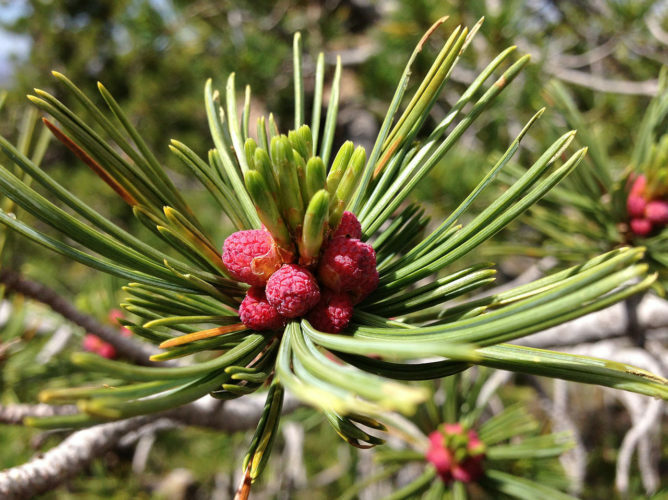 Attribution from: R. Kral; Pinus. Flora of North America Editorial Committee (eds. ): Flora of North America North of Mexico, Vol. 2. ©1993 Oxford University Press. 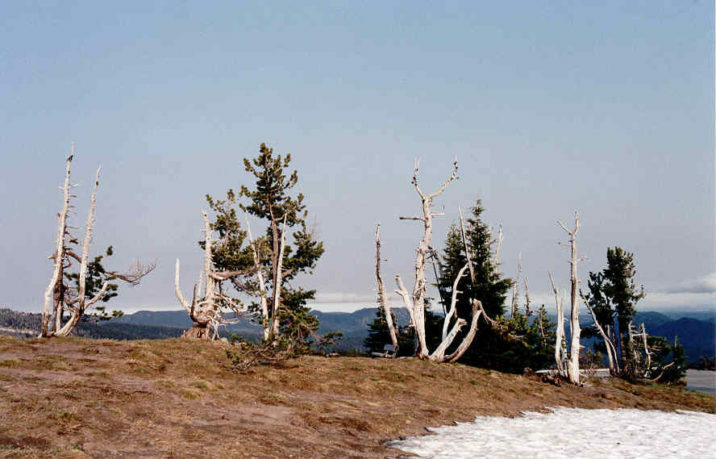 Mount Hood Whitebark pine — at Timberline Lodge on Mount Hood Oregon, summer of 1999 during ACS national meeting. A nice tight grove of Pinus albicaulis at a road turn-out along the rim drive at Crater Lake National Park, OR. Pinus albicaulis — a closeup of foliage and pollen cone detail. Pinus albicaulis — a closeup of foliage and seed cone detail.